The question is "What is the best way to deal with garden pests"? We all realize that wildlife is an essential part of nature, with bees, butterflies and other small creatures critical for the pollination of plants. However one has to strike a balance as some of them can also be extremely destructive. I know that while looking after your garden, one of the most disheartening problems that can arise is to walk outside to check out your vegetables and plants only to discover that caterpillers have reduced your cabbages to mere stalks. Among some of the most common pests are slugs, worms, caterpillars, birds, snails, rabbits, deer and the occasional gopher, and although it would not be wise to remove them completely, they must be kept under control if we are to benefit from all our hard work. Domestic animals too can fall into this category, dog and cats can be a real problem, running rampant across garden plants, digging holes and scratching and urinating against your prized possessions. Insects are among the worst garden pests to deal with; they are able to live in the soil, weeds, piles of leaves, or in any number of nooks and crannies they can find. One way to try and eliminate insects is to try and remove places where they can reside. Removing piles of leaves, weeds and decaying timbers near your vegetable patch can help greatly. You should also turn over your soil on a regular basis to break up and aerate clumps of dirt, disturbing places where insects hide, bringing them to the surface where birds can have an easy meal. An alternate way to control pests in your garden is to make use of an organic spray. This can help keep destructive insects and diseases in check. It's advisable to use the spray when your plants are in their dormant state, in most cases this will be February or early March. The Garden Safe spray offers gardeners alternative pest and disease control options to keep their gardens beautiful and bountiful and give them the peace of mind that comes with responsible gardening. Even birds can be classed as a pest at times, and they can be very persistant. It's no good trying to chase them away either, because as soon as you go inside they are right back again. Of course we don't wish to harm birds, so there has to be other ways of dealing with this problem. One option that I've come up with to keep the birds away from my fruit garden, and it works quite well, was to put a bird feeder in place. So as opposed to costing me money by consuming all of my fruit, the birds eat away quite happily at the bird feeder. 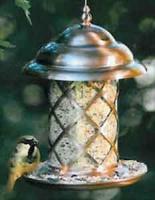 While not being the complete answer to eliminating bird problems, the birdfeeder has minimized the problem. If birds and domestic animals still prove to be somewhat of a challenge to your gardening efforts the addition of a scarecrow may solve the problem. The Contech Electronics Scarecrow Motion-Activated Sprinkler shown here presents an innovative, humane way to keep pets and wildlife from disturbing your yard and garden without the use of complicated traps or potentially hazardous chemicals. The sprinkler combines a surprise spray of water with unexpected motion and noise to create a safe, effective deterrent to unwanted visitors, helping keep your garden looking its best. Gophers can also be a challenge for the gardener in some areas of the country, thankfully this is one of the few garden pests that I haven't had to worry about. However a good friend of mine has battled with a substantial gopher infestation, so I took the time to dig a bit deeper into Gophers and their habits. I discovered that Gophers are of the rodent family. They are vegetarians and will eat eat roots, trees, shrubs, grass and plants. They can grow upto 14 inches long. Their fur can be black, light brown, or white, and they have small tails. They can devastate lawns, kill trees and destroy gardens. However, having said that they also play an important part in the local ecosystem too. One solution to rid yourself of these root eating garden pests is to set up traps. To be able to capture Gophers, it is important to locate the Gopher's tunnels and set the trap in the right way. This action should not be taken lightly and due consideration should be given to finding more acceptable methods of control. Gopher repellent is a viable option. Active ingredients are Castor Oil, Pepper and Garlic Oils. It incorporates unique emulsifying agents which allow the product to penetrate the soil quickly and effectively givingupto up to 60 days of coverage. An alternative way to get them away from your garden goodies is to use smoke bombs, which you place into their tunnels. Hopefully this will do the trick. If you find that your garden is being pillaged by any irksome pests, I recommend that you to try to eradicate the problem as quickly as is feasible. The more time you let the pesky blighters stay, the more established they will become and the more difficult they will be to remove.